SSL for WordPress is one of those topics that’s been a bit of a big deal (at least regarding being a point of discussion) ever since Google announced they were going to be using it as a signal for ranking. For these reasons, over the past few months we’ve been running tests taking into account whether sites use secure, encrypted connections as a signal in our search ranking algorithms. If you’re not a technical user, then the idea of setting up SSL on your site has to be a pain. Purchasing a domain, pointing nameservers, and hooking everything up to a hosting account is already enough to get people frustrated (and rightly so). And though this post isn’t necessarily about setting up SSL (perhaps I’ll cover it in the future as I’m a big fan of Let’s Encrypt for some of my latest projects), it is about arguably one of the best plugins I’ve found for quickly making sure your WordPress site is set up once you have a certificate installed. 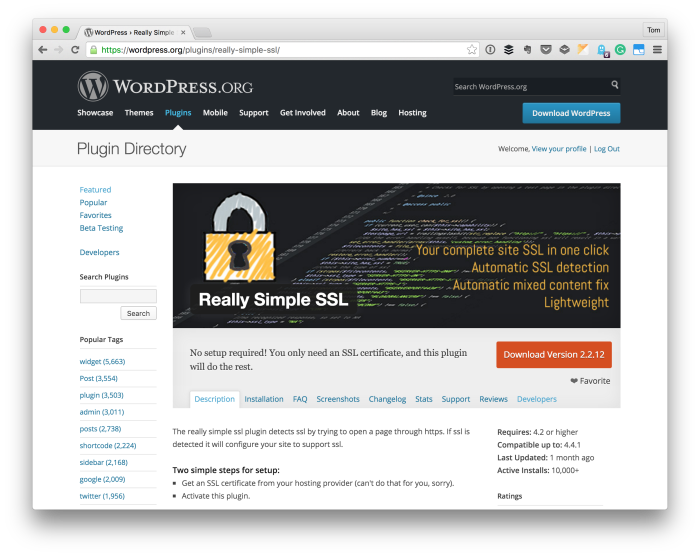 Though the WordPress plugin repository is replete with a variety of SSL-based plugins (and I’ve given several of them a fair shake), one that I am confident in recommending to others is Really Simple SSL for WordPress. The fact that it doesn’t add yet another menu item. Instead, it adds itself to the Settings menu. It gives clear, visual indicators as to if it’s working or not. If you’re unsure about something, it has documentation to explain what something is about. It offers an optional debug mode that you can turn on to review whatever may be causing you problems. Of course, there’s more, but those a few of the things that seem harder to come by in many plugins. It’s nice to see something built that follows more of “the WordPress way” of doing things. Anyway, assuming you’ve gone through the process of obtaining an SSL certificate, installed it, and are now looking for how to configure your website, this plugin is one of your best bets. I’ll have to take a look at this. 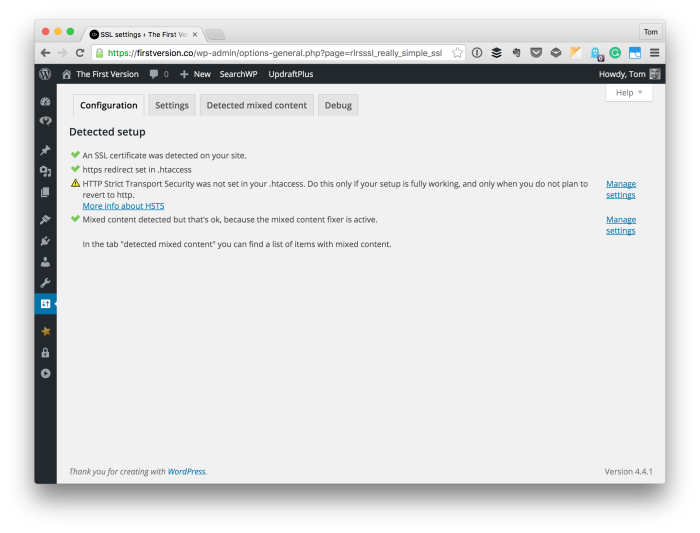 I’ve been considering taking my blog to full SSL, not just the admin side. Before using it, I recommend looking at LetsEncrypt.org. Once you’ve got the certificate installed, then install this plugin. That flow works great, IMHO. Thanks for the nice find, Tom. Bookmarked. Why not take your admin side to SSL? imo if one is going to use SSL its to your benefit to secure your entire site, not just partially. Having SSL on your frontend but not your backend is kinda like putting putting locks on your house doors but never locking them. When it comes to the admin, there may be insecure elements depending on the plugins you’re using and where they are getting their resources, but it’s not something worth avoiding (I didn’t mean to imply otherwise, if I did — you can even see it running in the admin in my screenshot :). duh and just re-read and realized Eric seems to be saying he already HAS his admin secured. The only reason I piped up is because it baffles me whenever I see people talk about only securing part of their site. There was a time (a while ago) where it kinda made sense because SSL slowed things down, but not anymore. Interesting. Does it work with Varnish, my guess is no? I’m not sure — I’ve never actually tried it with Apache nor Nginx and Varnish, TBH.